The following information contains the changes, updates and additions to Supervising Station Alarm Systems found in Chapter 26 of the NFPA 72 2016 edition. Remember if you see a * make sure to consult the Annex A for additional information. All information highlighted in this light blue color is NEW to the 2016 edition of NFPA 72. 26.2.1.1 Alarms signals initiating by manual fire alarm boxes, automatic fire detectors, waterflow from the automatic sprinkler system, or actuation of other fire suppression system(s) or equipment shall be treated as fire alarm signals. 26.2.1.2* Except as permitted by 26.2.2 and 29.7.9.2, all fire alarm signals received by a supervising station shall be immediately re-transmitted to the communications center. 26.2.1.3 Fire alarm signals received at the supervising station by a zone or zones shall be re transmitted by zone to the communications center. 26.2.1.4 Fire alarm signals received at the supervising station that are identified as an individual point or points shall be re-transmitted by point identified to the communications system. 226.3.4.7 The authority having jurisdiction identified in 26.3.4.2(5) shall be notified within 30 calendar days of the expiration or cancellation by the organization that listed the prime contractor. Notify the authority having jurisdiction and the subscriber when sprinkler systems or other fire suppression systems or equipment have been wholly or partially out of service for 8 hours. When service has been restored, provide notice to the subscriber and the authority having jurisdiction of the nature of the signal, the time of occurrence, and the restoration of service when equipment has been out of service for 8 hours or more. The following information contains the changes, updates and additions to Protected Premises for Fire Alarm Systems found in Chapter 23 of the NFPA 72 2016 edition. Remember if you see a * make sure to consult the Annex A for additional information. 24.3.1.2* Where no listed loudspeakers exist to achieve the intelligibility requirements of the Code for a notification zone, non-listed loudspeakers shall be permitted to be installed to achieve the intelligibility for that notification zone. 24.3.5.4.1 In addition to the requirements of 23.6.3, a risk analysis shall be performed and approved by the AHJ. 24.3.13.7 Two-way in-building emergency communications systems shall have a pathway survivability of Level 2 or Level 3. Exception: Level 1 shall be permitted where the building is less than 2-hour fire-rated construction. 24.3.13.9.1 Area of refuge emergency communications systems shall have a pathway survivability of Level 2 or Level 3. Exception (1): Level 1 shall be permitted where notification zones are separated by less than 2-hour fire-rated construction. 24.5.14.3 If a horizontal reach of 10" (25 cm) to 24" (61 cm) is required, the maximum elevation shall be limited to 42" (107 cm) above the finished floor and the minimum elevation shall be limited to 28" (71 cm). 24.5.14.4 Text and visual indicators, including lamps, screens, displays, instructions, or labels, associated with control or operation shall be visible within all points of elevation between 40" (102 cm) and 60" (152 cm) above the finished floor. 24.5.14.5 Where controls and information are provided in accordance with 24.5.14.2 through 24.5.14.4, provision of additional or redundant controls shall be permitted within the same vicinity at an elevation or reach other than those indicated. 24.5.14.6 Dimensions other than those identified in 24.5.14.2 through 24.5.14.4 shall be permitted when documented within the emergency response plan that ADA guidelines are not applicable or when otherwise required by the AHJ. 24.5.18.8 Addressable primary textual and graphical visible appliances using signaling line circuits shall meet the performance requirements of section 23.6. 24.5.18.9 Non-addressable primary textual and graphical visible appliance circuits shall meet the performance requirements of section 23.7. 24.10.3 The remote area of refuge stations and the central control point shall communicate with each other via pathways based on their performance capabilities under abnormal or fault conditions in accordance with the requirements for Class A, Class B, Class N, or Class X pathways specified in Chapter 12. 24.10.4 All pathways between a remote area of refuge stations and the central control point shall be monitored for integrity. 24.12.1 Where required by the building code in force and not included as part of another emergency communications system, a stairway communications systems shall be installed in accordance with 24.12. 24.12.2 The stairway communications system shall be permitted to be integrated with another two-way emergency communications system providing it is installed in accordance with 24.12. 24.12.5* Quantity and locations of the remote communications points shall be as required by the building code in force and engineer specifications. 24.12.6* If the central control point is not constantly attended, it shall have a timed automatic communications capability to connect with a constantly attended monitoring location acceptable to the authority having jurisdiction here responsible personnel can initiate the appropriate response. Similar language for Areas of Refuge in Section 24.12.5. 24.12.7 The physical location of the central control point shall be as designated by the building code in fomrce or the authority having jurisdiction. Similar language for Areas of Refuge in Section 24.10.6. 24.12.9 instructions for the use of the stairway communications system, instructions for summoning assistance via the systems, and written identification, including in braille, of the location shall be posted adjacent to each remote communications point. Similar language for Areas of Refuge in Section 24.10.8. 23.1.2 The Requirements of Chapters 7, 10, 12, 17, 18, 21, 24 and 26 shall apply, unless otherwise noted in this chapter. 23.2.2.1 A record of installed software and firmware version numbers shall be prepared and maintained in accordance with sections 7.5 and 7.7. 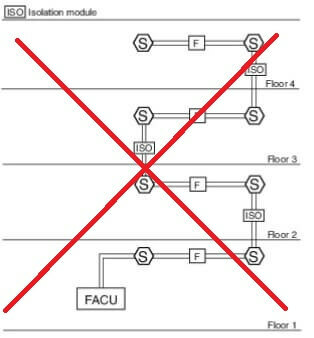 23.6.1* A single fault on a pathway connected to the addressable devices shall not cause the loss of the devices in more than one zone. 23.6.1.1 For the purpose of this section, each floor of the building shall be considered a separate zone. 23.6.1.2 For the purpose of this section, if a floor of the building is subdivided into multiple zones by fire or smoke barriers and the fire plan for the protected premises allows relocation of occupants from the zone of origin to another zone on the same floor, each zone on the floor shall be considered a separate zone. Circuits between enclosures containing transponders and control units regardless of the number of initiating devices, notification appliances, or control relays that may be connected to those control units. Circuits connecting short-circuit fault isolation modules to enclosures containing transponders and control units where the conductors are installed in metallic raceway or equivalently protected against mechanical injury and where the circuit does not exceed 3 feet (1 m) in length. 23.6.1.4 The loss of more than one zone shall be permitted on a documented performance-based design approach. 23.6.1.5* Performance-based designs submitted to the authority having jurisdiction for review and approval shall include documentation, in an approved format, of each performance objective and applicable scenario, together with technical substantiation used in establishing the proposed zone performance. 23.8.2.7 Each interconnected fire alarm control unit shall be separately monitored for alarm, supervisory, and trouble conditions with supervised pathways that are in accordance with the manufacturers' published instructions. 23.8.2.7.1 Alarm conditions on interconnected fire alarm control units shall annunciate as alarm signals and initiate the evacuation signals. 23.8.2.7.2 Supervisory conditions on interconnected fire alarm control units shall annunciate as supervisory signals. 23.8.2.7.3 Trouble conditions on interconnected fire alarm control units shall annunciate as trouble signals. 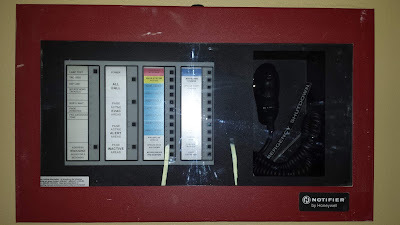 23.8.2.7.4* Where supervised pathways between interconnected fire alarm control units is not achievable, a supervised annunciator shall be installed adjacent to the control unit(s) to annucnaite the status of each control unit. 23.8.2.9.1 Where multiple control units of the same manufacturer are interconnected in a network arrangement and serve the same protected premises, the control units shall be arranged to be reset or silenced from one location. 23.8.2.9.2 Where multiple control units of different manufacturers are interconnected in accordance with 23.8.2.5 through 23.8.2.8 and serve the same protected premises, the control units shall be permitted to be reset or silenced individually at each control unit. 23.8.2.9.3 Resetting procedures shall be documented and permanently posted beside each control unit and annunciator. 23.8.5.1.2 Where connected to a supervising station, fire alarm systems employing automatic fire detectors or waterflow detection devices shall include a manual fire alarm box to initate a signal t the supervising station. 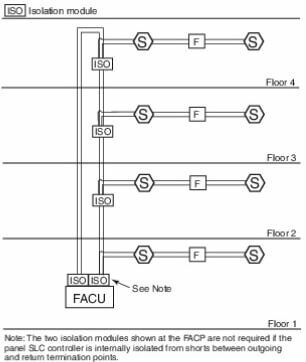 Exception: Fire alarm systems dedicated to elevator recall control, supervisory service and fire sprinkler monitoring as permitted in section 21.3 of NFPA 72. The alarm verification feature is not initially enabled, unless conditions or occupant activities that are expected to cause nuisance alarms are anticipated in the area that is protected by the smoke detectors. Enabling of the alarm verification feature shall be protected by password or limited access. A smoke detector that is continuously subjected to a smoke concentration above alarm threshold does not delay the system functions of sections 10.7 through 10.16 or 21.2.1 by more than 1 minute. 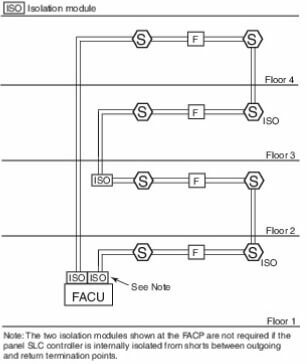 Actuation of an alarm-initiating device other than a smoke detector causes the system functions of section 10.7 through 10.16 or 21.2.1 without additional delay. The current status of the alarm verification feature is shown on the record of completion. (5) Operation of a patient room smoke detector in I-2 and R-2.1 occupancies shall not include an alarm verification feature. 23.8.5.6.3* If a valve is installed in the connection between a sprinkler system and an initiating device, the valve shall be supervised in accordance with 17.16.1 unless the valve is arranged to cause operation of the supervisory signal initiation device when it is in its non-normal position. The following information contains the changes, updates and additions to Emergency Control Function Interfaces found in Chapter 21 of the NFPA 72 2016 edition. Remember if you see a * make sure to consult the Annex A for additional information. 21.1.1 The Requirements of Chapters 7, 10, 17, 18, 23, 24, and 26 shall apply, unless otherwise noted in this chapter. 21.1.3 The requirements of this chapter shall not apply to Chapter 29 unless otherwise stated. 21.2.6 The installation wiring between the fire alarm control unit and the emergency control function interface device shall be Class A, Class B, Class D, Class N, or Class X in accordance with NFPA 72 Chapter 12 Circuit Pathways. 21.3.1 All fire alarms initiating devices used to initiate elevator phase 1 emergency recall operation shall be connected to the required building fire alarm system. 21.3.2* In facilities without a required building fire alarm system, fire alarm initiating devices used to initiate elevator phase 1 emergency recall operation shall be connected to either a non-required building fire alarm system or a dedicated function fire alarm control unit that shall be designated as "elevator recall control and supervisory control unit," permanently identified on the dedicated function fire alarm control unit and on the record drawings. The following is a California State Amendment. 21.3.6 Smoke detectors shall not be installed in un-sprinklered elevator hoistways unless they are installed to activate the elevator hoistway smoke relief equipment or where required by Chapter 30 by the California Building Code (CBC). CBC: 3005.4.1 Automatic sprinkler system. Automatic sprinklers shall not be required to be installed in the elevator hoistway, elevator machine room, elevator machinery space, elevator control space, or elevator control room where the following are met. NOTE: All 6 of the following conditions must be met. Approved smoke detectors shall be installed in the elevator hoistway, elevator machine room, elevator machinery spaces, elevator control spaces, or elevator control rooms and connected to the building fire alarm system in accordance with Section 907. Activation of any smoke detector located in the elevator hoistway, elevator machine room, elevator machinery spaces, elevator control spaces, or elevator control room shall cause the actuation of the building fire alarm notification appliances in accordance with section 907. Activation of any smoke detector located in the elevator hoistway, elevator machine room, elevator machinery spaces, elevator control spaces, or elevator control room shall cause all elevators having equipment located in that elevator hoistway, elevator machine room, elevator machinery spaces, elevator control spaces, or elevator control room to recall nonstop to the appropriate floor in accordance with CCR Titile 8, Division 1, Chapter 4, Subchapter 6, Elevator Safety Order. The elevator machine room, elevator machinery spaces, elevator control spaces, or elevator control room shall be enclosed with fire barriers constructed in accordance with Section 707 or horizontal assemblies constructed with Section 712, or both. The fire-resistance rating shall not be less than the required rating of the hoistway enclosure served by the machinery. Openings in the fire barriers shall be protected with assemblies having a fire protection rating not less than that required for the hoistway enclosure doors. The exception to Section 3005.4 shall not apply. An approved sign shall be permanently displayed in the elevator machine room, elevator machinery space, elevator control space, or elevator control room in a conspicuous location with a minimum of 1 1/2" letters on a contrasting background stating, NO COMBUSTIBLE STORAGE PERMITTED IN THIS ROOM By Order of the Fire Marshal (or name of fire authority). 21.3.11 Actuation from the elevator hoistway, elevator machine room, elevator machinery space, elevator control space or elevator control room smoke detectors or other automatic fire detection as permitted by 21.3.9 shall cause separate and distinct visible annunciation at the building fire alarm control unit or at the fire alarm control unit described in 21.3.2. Removed the following portion: and at required annunciators to alert firefighters and other emergency personnel that the elevators are no longer safe to use. 21.3.13 Separate outputs from the building fire alarm control unit or the fire alarm control unit or the fire alarm control unit described in 21.3.2 to the elevator controller(s) shall be provided to implement elevator Phase 1 Emergency Recall Operation in accordance with Section 2.27 of ANSI/ASME A17.1/CSA B44, Safety Code for Elevators and Escalators, as required in 21.3.13 through 21.3.13.3. 21.5 Fire Service Access Elevators. Where one or more elevators are specifically designated and marked as fire service access elevators, 21.5.1 and 21.5.2 shall apply. 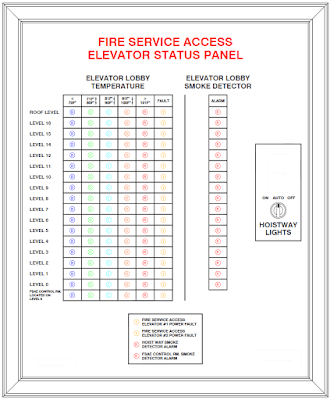 21.5.1* Status of elevator(s), including location within the hoistway, direction of travel, and whether the elevator(s) are occupied, shall be permitted to be displayed on a building fire alarm system annunciator located at the fire command center. 21.5.2 Temperature and presence of smoke in associated lobbies, machine rooms, control rooms, machinery spaces, or control spaces shall be continuously monitored and displayed on a building fire alarm system annunciator located in the fire command center. The conditions in 21.5.1 and 21.5.2 shall be permitted to be displayed on a standard emergency services interface complying with Section 18.11. 21.8.3 All door and shutter hold-open release and integral door and shutter release and closure devices used for release service shall be monitored for integrity in accordance with section 12.6. 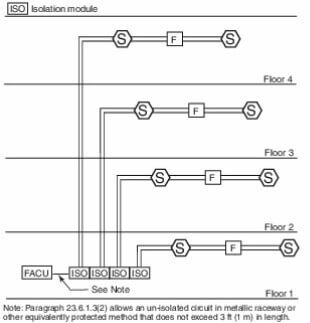 Exception: Pathways installed as Class D circuits in accordance with 12.3.4. The following information contains the changes, updates and additions to both the audible and visual characteristics found in Chapter 18 of the NFPA 72 2016 edition. Remember if you see a * make sure to consult the Annex A for additional information. (1) The alarm signal shall be a sqaure wave or provide equivalent awaekening ability. 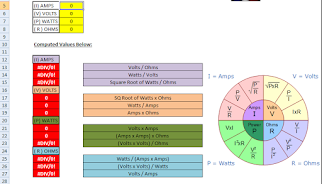 (2) The waveform shall have a fundamental frequency of 520 Hz + or - 10%. (3)* The notification equipment shall be listed for producing the low frequency waveform. 18.5.3.2* The maximum light pulse duration shall be 20 milliseconds with a maximum duty cycle of 40 percent. Exception: Lights used to meet the requirements of 18.5.5.5 shall be permitted to be listed and labeled to have pulse duration up to 100 milliseconds. Table 18.5.5.7.2 Effective Intensity Requirements for Sleeping Area Visible Notification Appliances. There are not too many updates to chapter 14 in the newest version of the National Fire Alarm and Signaling Code. 1.2.2.2.4 In the event that any equipment is observed to be part of a recall program, the system owner or the systems owner's designated representative shall be notified in writing. 14.4.6.1 Testing. Household fire alarm systems shall be tested in accordance with the manufacturer's published instructions according to the methods of Table 14.4.3.2. Below is a breakdown of the updates and changes to NFPA 72 2016 Chapter 10 Fundamentals". remember to consult the Annex A if you see an *. Note: The next two code sections are California Amendments. These only apply if you are performing work in the state of California. 10.3.1 Equipment constructed and installed in conformity with this code shall be listed for the purpose for which it is used. Fire Alarm systems and components shall be California States Fire marshal (CSFM) approved and listed in accordance with California Code of regulations, Title 19 Division 1. 10.3.3 All devices and appliances that receive their power from the initiating device circuit or signaling lice circuit of a control unit shall be California State Fire Marshal (CSFM) listed for use with the control unit. This is a great addition to the code as it establishes a baseline for the supervision and guidance for trainees or apprentices. 10.5.1.5 System design trainees shall be under the supervision of a qualified system designer. 10.5.3.5.2 System installation personnel shall be permitted to configure systems in the field per the manufacturer's published instructions. 10.5.3.5.3 System end users shall be permitted to manage operation per manufacturer's published instructions or training. 10.5.4.1 Fire Alarm system and emergency communications system plans and specification submitted for review and approval shall be reviewed by personnel who are qualified to review such plans and specifications. 10.5.4.2 Fire Alarm system and emergency communications system installations shall be inspected by personnel who are qualified to perform such inspections. 10.5.4.3 State or local licensure regulations shall be followed to determine qualified personnel. (3) Assignment by the authority having jurisdiction to perform plan reviews and inspections. Note: The next code section is a California Amendment. This only applies if you are performing work in the state of California. 10.7.1 Where approved by the AHJ, ECS priority signals when evaluated by stakeholders through risk analysis in accordance with 24.3.11 shall be permitted to take precedence over all other signals. 10.11.2* Visible notification appliances, textual visible notification appliances, and speaker notification appliances located in the same area shall be activated and deactivated as a group unless otherwise required by an ECS emergency response plan. 10.11.3 Visible alarm strobe notification appliances shall not be activated when speaker notification appliances are used as permitted by 24.3.5 for non-emergency paging.